The third installment of the Transformers titled Dark of the Moon is named appropriately. It is dark, gloomy and violent. It's all about lost friendship, betrayal and losing what you thought is yours. 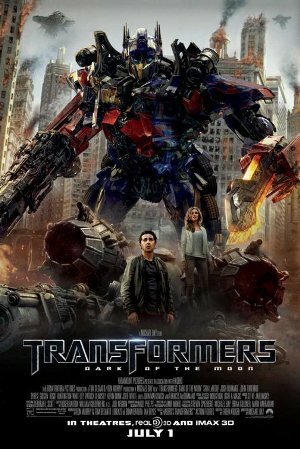 We see some rays of hope here and there but even Optimus Prime has become more brooding and angry. The movie begins with a little disruption in the space time continuum or rewriting of history if you will. During the battle for Cybertron, a lone ship called the Ark and piloted by Sentinel Prime (voiced by SciFi god Leonard Nimoy) escaped the battle worn planet. It carried the "Pillars", which could have shifted the battle in favor of the citizens of Cybertron. The Ark crash landed on the moon and was promptly detected by NASA in 1961. Thus began the space race between the two superpowers of the time, US and USSR. Until Apollo 11 landed on the moon in 1969 and found the wreckage of the Ark and brought home some artifacts, with the astronauts swearing never to tell a soul about the ship. Hey, they even brought Buzz Aldrin in the movie to tell us what they saw during the 21 minute break in communication between earth and the moon 42 years ago. Fast forward to the present and the Autobots are now allied with the Americans. A botched operation in Chernobyl resulted in the discovery by Optimus of a power cell from the Ark. This is where he started to, uhm, transform into a dark, moody, angry autobot. Go watch the movie to find out what happened next. The movie is fast paced, action packed and violent. We now see people getting killed by the Decepticons. (By the way, was that blood coming from the Decepticon when they were hacked to pieces by the Autobots?) In other words, the movie is all high testosterone. Some parts however felt like I was watching Independence Day, especially when Optimus Prime made the speech about their fight for freedom. Speaking of testosterone, guys will not miss Megan Fox at all. Rosie Huntington-Whiteley is super hot. From her opening scene showing her derrière and yes, in that scene where she wore a body hugging white dress, she was just smoldering. Seriously though, she needs to get some acting lessons. I saw the movie during the special screening sponsored by Nuffnang and PLDTMyDSL last night at the Shangrila Mall. There were several cosplayers in the lobby before screening time who were in their autobot costumes. Some were game enough to pose for pictures with their fans. A group of young kids got the scare of their young lives when Bumblebee's head rolled on the floor. Literally. Off went the cosplayer running after his headgear while the kids ran back to their parents. Ugh... where's my camera when I needed it? It was raining cats and dogs last Friday but that didn't stop me from going to the Rizal Park to watch Cirque de Soleil's Varekai. Was it worth the trouble? You bet! The show was simply amazing! Varekai follows the story of a young angel who fell from the sky into an enchanted world under a volcano. The various creatures that inhabit the place helped him learn to fly again. The storyline is not important however because this IS a circus after all. The set was quite simple with only some tall poles jutting out from the back. But the use of lights made up for its simplicity. Come to think of it, you wouldn't go there for the sets but for the performance! The show features a lot of acrobatic acts that highlighted the skills, strength, fluidity and grace of the performers. All acts were accompanied by music which was a blend of jazz, latin, africa, etc., and performed live by a band and singers. My favorite parts include the net, the loop and the swing. The swing must be the most memorable for most of the audience because of its high energy complemented by the pulsing background music. The clowns were also so hilarious and their gags brought the house down. I must mention that the male clown even spoke in Tagalog to engage the audience to participate in one of his acts. Honestly, I cannot write every performance because I am sure I will run out of superlatives to describe them. But it will suffice to say that the two hour show was so enchanting and exciting that I still feel its energy even as I write this. In fact, we were so high after the show that we didn't mind walking in a few inches of water as the rain buffeted us on our way to get a ride home. I must add here that the circus tent was so sturdy that once inside, you cannot even feel the strong winds and rains brought about by the typhoon. It was like being inside a cozy building. No wonder we were able to concentrate on and be enraptured by the program. If it were not for the ticket price (which is way too steep for the average Filipino), I will tell everyone to watch the show. Varekai will run until July 17. I think I blinked that's why I didn't see that Apple has unlocked the iPhone 4. It was only when I visited the Apple Online Store (US) this morning that I discovered about it. The unlocked iPhone 4 works with a micro-SIM from any, yes any, supported GSM wireless carrier. Since it is sold without any contract commitment, you can use it even with your current telco. You can also decide to change telcos if you want to. The unlocked units also have all the features as the locked ones, including FaceTime, Retina display, and HD video camera. 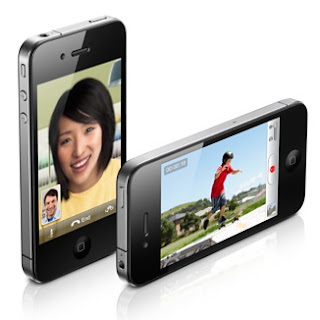 For those of us in the Philippines, the unlocked iPhone 4 will work with any of our wireless carrier as long as they have a micro-sim card. No more locked in period of 24-months needed, so we don't have to live with poor customer service. I really wonder what made Apple to unlock the iPhone. Their move seemed to be targeted towards those who want to use their unit while in another country. I doubt if that group, however, comprise a large chunk of their clientele. My hunch though is that this is a precursor of something big that will happen with the upcoming iPhone 5. Let's wait and see. Will Mac OS X Lion Kill the Mouse? When Apple announced the release of OS X Lion next month, one of its new features that really caught my interest was the multi-touch gestures function embedded in the OS and its applications. It's a new way to interact with your Mac, says Apple. You now pinch, swipe, scroll. tap on your trackpad or magic mouse to control what's on your screen. No need to click on the mouse buttons to select, highlight or scroll something on the page you're viewing. Oh, speaking of scrolling, Apple has also decided to hide the scrollbar in Lion to give us a bigger screen space when using any application. It will only re-appear when the you scrolls down the page and quickly fades out when you stop. That means, we will not run out of space when scrolling just like we do when using a mouse. Now how does this kill the mouse? Of course, every MacBook has a multi-touch trackpad that would recognize these gestures. But it's a different scenario with desktops. 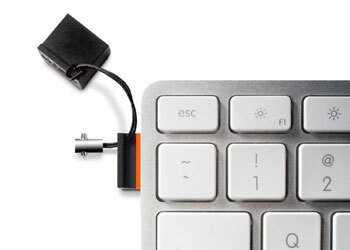 You see, aside from the Magic Mouse, one has the option to use a Magic Trackpad with the MacPro, iMac or Mac Mani. There's a little bit of learning involved with the multi-touch gestures but it wouldn't take a lifetime I believe. So come July, the days of the mouse and its buttons are numbered. At least with the Mac for now. LYTRO: The Future of Photography? An exciting revolution is about to happen in the way we take pictures. A start up company in Silicon Valley called LYTRO is set to release a new kind of camera to the consumer market. They call it the light field camera and what it does is it uses the power light to help you capture life's precious moments. The secret is in the sensor which captures all the light rays in the scene. Unlike conventional cameras, this new sensor records the color, intensity, and direction of the ray of light. A special software inside the camera will process all these information to allow the viewer to switch focus points. Thia means there is no need to worry about focusing your shot anymore or whether the auto-focus function in your camera actually focused on your intended area. In fact, the company's slogan is "Shoot now, focus later." You can give it a try with the photo below. Click on Elvis and see what happens. Want to try more of this? Then head off to the company's website and have fun with their Picture Gallery. PLDT myDSL’s Internet to Sawa TRANSFORMS my Internet experience from boring to AWESOME! There was a time when Internet browsing meant waiting for a long time before the website I am visiting fully loads. With the advent of PLDT DSL, the entire Internet experience changed with webpages loading faster than saying, well, Internet. Now, PLDT myDSL is set to take an extra ordinary transformation for their users through PLDT myDSL Internet to Sawa starting this month. Plan 3000 subscribers will get a free and unlimited speed boost of up to 5Mbps from their previous 3Mbps. Everyone can now surf, stream, download and play games online up to sawa! To complement this new online experience, PLDT myDSL subscribers will also get free WatchPad with more exclusive content plus one year of free PLDT to PLDT NDD calls. If doesn't transform your life, I don't what will! It's like my transformation from just another blogger to a Nuffnanger. While I used to be limited to writing about everyday stuff, after joining Nuffnang I got more stuff to write about. What more, I get to meet lots of interesting fellow bloggers who share the same passion to share things to the world. If you want to transform your online life and surf all you want at awesome speeds, head over to and visit www.myworldmydsl.com for more information or call 171 to confirm your subscripstion today! I have often wondered about "Metropolis ", Fritz Lang's 1927 silent movie about a dystopian city of the future. I've only seen some parts of it but never the entire movie. I finally had the chance to see it in its entirety and I confess that I instantly became a disciple. Dubbed as the mothership of all science fiction movies, Metropolis tells about a city divided into only two social classes, the elite who live leisurely in their futuristic city above and the workers who live in horrible conditions in the underground. A theme that still resonates today. It says that the mediator between the mind and the hand is the heart. Metropolis is so much ahead of its time. From the sets, to the effects, to the story and the music. In fact, many of its elements can still be found in movies made 50 years after its release. There's a mad scientist working in an art deco laboratory. He created an evil she-robot (called Machine-Man in the movie) which could pass up as the mother of C3PO because of their striking resemblance. The set of the underground where the workers toil obviously inspired one of Madonna's MTVs. And, dig this, to see what his workers are up to, the ruler of Metropolis uses a telephone with video! Yup, even before Steve Jobs was born, Lang has already used FaceTime in this movie! Indeed, even critics agree that the movie remains one of the most influential in any genre. The story of how Metropolis became complete is also a good one. When it came out in 1928, some American film distributors deemed the movie to be too long to be commercially viable. What they did was to edit, no, chop the film to a point where only 90 minutes out of the original almost 3 hours running time was left. Nobody has seen the movie the way Fritz Lang envisioned it since then. Over the years, German film institutes tried to come up with a version that is closer to the 1928 original. In 2002, restorers came up with a much longer version using parts that were found in the then East Germany state. The version I saw was this 2010 restoration. It was given the state of the art digital treatment. Unfortunately, the 16-mm copy was made in the 1970s straight from the original prints and it included all the scratches and damages which cannot be remedied by today's technology. One can easily see where the new scenes where inserted because the scratches were highly visible and since they were copied from 16-mm negatives, they have a different size. I really don't mind though, I would rather have these imperfections than not seeing these parts of the film. So this is the closest we can get to the original film. I'd say that it is a must see for everyone who loves cinema, in any genre. With this version, Fritz Lang's vision can be seen again with all its glory. Hopefully, Metropolis would spring another surprise that another more complete version comes out in another country. While lying in bed this morning, this scene caught my attention. The early sun light filtering through the curtains cast shadows of the window grills and contrasted with the golden leave prints. The contrast between the bright light and the dark shadows was a sight to see. I grabbed my camera and took a shot of the scene. Admittedly, nature is far better at making such beautiful view than any man-made device. 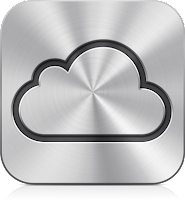 Along with the announcement of the coming MacOS X Lion last Monday, Apple announced its new service called iCloud, which is coming in Fall this year (around September). The Mac community has been abuzzed with speculations about this new offering for months before the WWDC. It was finally introduced by Steve Jobs himself at last Monday's event. In his address, Jobs explained that ten years ago, their big idea was to make the PC/Mac the center of users' digital life where music, videos and photos are stored. But all's that changed now because of the new devices that could also store and play music, video and photos. So Apple's new big idea is to make the PC/Mac as just another device and put all media files in the cloud they named iCloud. But this cloud is not just a harddisk in the sky, as Steve pointed out. iCloud automatically uploads, stores and pushes your contents to all of your devices. It is also completely integrated to all apps so everything happens automatically and there's nothing to learn. As Steve puts it, "It just works." Jobs said that they at Apple love iCloud so much that they're giving the service to their clients for free! Everyone is given a 5GB space in the iCloud where you can store your Contacts, Mail, Calendar and yes, even your Documents. No need to bring a USB drive to bring your Keynote presentation or Pages papers. Of course everything you buy from the AppStore, iBookstore and iTunes store are automatically uploaded to your iCloud. What more, your apps, books and music are not counted against your free space as long as they remain in their respective stores. You can already try this service in beta. If you are an iTunes user like me, if you buy something from the store, you can make your other devices to download your purchase automatically at no extra cost. Just go to the settings of your iPad or iPhone and make them automatically download your purchases. Yes, it just works! I recently attended a presentation called Pulong Saliksikan on MDGs at the Philippine Institute for Development Studies (PIDS). The presenter, Dr. Roehlano Briones, said that initial results of their study showed that the country will not achieve its MDG commitments for education and maternal health, and will only achieve minimal reductions in poverty under the present scenario. To close the gaps, government must increase public spending in these sectors. He added that the country failed to achieve the first MDG on fighting extreme poverty. Simulations showed that per capita income growth will not reduce poverty since the economy will not able to create higher paying jobs up to 2015. The study recommends that government to close the MDG gaps through tax financing. This is feasible if there is an increase in efficiency in government tax collecting efforts. The proponents argue that this has been achieved before so there is no problem in doing it again. They also recommended introducing new tax policies such as the rationalization of fiscal incentives and imposition of sin taxes on tobacco and alcohol. Other sources of funds may come from increasing the charges for road users, especially trucks that inflict most damage to our roads. Excise taxes on petroleum products may also be increased. To learn more how the Philippines is faring with achieving the MDGs, click here. While browsing the Internet for new gadgets, I came upon an article on an interesting product from LaCie called MosKeyto, an ultra-small USB storage device. It caught my interest because I like small gadgets and this one is is so small that one photo shows it as hardly noticeable when plugged in a USB port of a computer. Reading it's specs however, I found out that it may be tiny in size but big in capacities from 4GB to as much as 16GB! LaCie promises that you can keep this plugged in and it will not harm your computer. 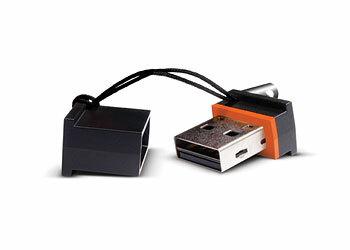 It is also compatible with both Windows and Mac operating systems. I think I will look for one of these in the local stores if it is already available. Amazon.com offers it starting at US$15.33 for the 4GB unit, US$23.43 for 8GB and US$48.18 for the 16GB model.